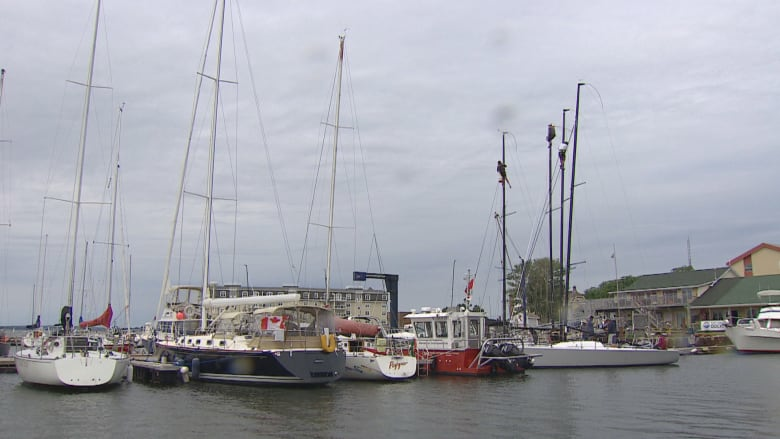 Charlottetown's harbour will be filled with racing boats this week. The Charlottetown Yacht Club's annual race week runs Thursday through Saturday and will feature Canadian championships in two classes. Ice boat replica to make historic journey Saturday on P.E.I. Sailors in the J70 and Farr 30 classes will compete for not only a national title, but a berth in next year's world championship in the U.K. The week's festivities will celebrate 33 years of keel boat racing in Charlottetown. Rich Jones of Hamilton is skipping one of the J70 boats. "This type of boat is one of the most competitive fleets in the world right now. Some of the events we've been to, there's been America's Cup sailors and Olympians," Jones said. The crew on Jones' boat, Maverick, are from Oakville, Ont. It's his first time sailing in P.E.I., he said. "It looks great. Really nice-looking clubhouse and great facilities. We're looking forward to it." Not only that, his crew experienced some good old Island hospitality. "[Wednesday] morning, one of the local guys came up to make sure we were OK and handed us a bottle of rum." Kim Gibson of Fredericton will also compete in the J70 class. Her boat is called Seaya. It's not Gibson's first time. She said "the people here, the hospitality, the social events and the great sailing conditions" keep her coming back. The mix of light and heavy breeze in Charlottetown's waters creates an even playing field for everyone, she said. "The competition is intense. Pretty much anyone who has a boat is competitive and good, so it's nail-biting conditions, which is great." Gibson's crew is just hoping to finish in the top half of the pack, she said. All the sailors help each other out. "Everyone's collaborative and sharing tricks and things on the water, so we're all getting better together." Sandy MacMillan of Lunenburg, N.S., is a former Olympian who's been sailing in P.E.I. since the 1970s. "I love sailing here. I've made a lot of lifelong friends here. I've sailed against them and with them," he said. "Sailing is a life sport. You make friendships. It's always good to see how [much] greyer we are, a little heavier around the middle," he laughed. The "beautiful Island scenery" makes for a nice experience regardless of the weather, MacMillan said, but sailors do enjoy a challenge. "When it's breezy, it's tidal here and it's interesting conditions. That's what sailors like to react to. They like to react to different conditions. It's no fun sailing in a place where it's the same every day." MacMillan wants to promote the sport and see younger people get out on the water. "It's always about mentorship for the older guys like me, who try to show and help the younger guys get involved," he said. "It's a good thing in Atlantic Canada we have nice waters to sail in, and it's an easy way to get your whole family involved."